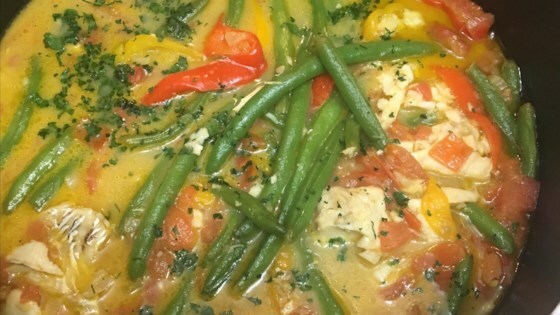 "Lightly spicy, this is a wonderful creamy fish curry. Try with whatever white fish you like. Serve with brown rice." Combine curry powder, ground ginger, and ground turmeric in a skillet; toast the spices over medium heat until browned, about 5 minutes. Pour olive oil and garlic into the spice mixture and stir to make a paste. Stir onion into the spice mixture; cook and stir until the onion is tender, 5 to 7 minutes. Stir about half the coconut milk and half the water into the onion mixture; simmer together for 5 minutes. Add cod to the mixture; continue cooking until the fish is firm, about 5 minutes. Add tomato, remaining coconut milk, and remaining water to the skillet; cook until the tomato is softened, about 5 minutes. This was just ugh. It was bitter. I am not sure what happened. I tried adding sugar, lime juice, peanut butter, soy, and it was still barely edible. Great recipe! I substituted coconut oil for the vegetable oil for more coconutty flavor, and kicked up the spice with some red pepper flakes. A good starting point for a very mild fish curry. I used grouper cheeks. Totally needed salt and spice/heat. This is a wonderful recipe. The first time, I made it as written. Today, I doubled the recipe and added a head of cauliflower. It's great!